Ads By Prizecoupon could be created by schemers, and they could present highly misleading offers. Due to this, you simply cannot click on these suspicious online advertisements. If you do, you are bound to open up security backdoors that will be used by schemers and malware distributors. If this happens, it is likely that you will need to delete a bunch of undesirable and malicious programs from your operating system. Of course, at this moment it is most crucial to remove Ads By Prizecoupon-related adware. Of course, the suspicious, often misleading Ads By Prizecoupon do not just randomly show up on the pages that you browse. These advertisements are displayed only after you install Prizecoupon on your Windows operating system. This application is a clone of BestDiscountApp, TakeSave, Dragon Coupon, and other untrustworthy ad-supported programs created on the Justplugit engine. We advise removing all applications associated with this engine, but right now it is most important to find and delete Ads By Prizecoupon, because it could lead to the installation of other malicious apps. The distributor of Ads By Prizecoupon is unknown, but it is clear that the Installrex, Amonetize, and Vittalia installers are used in most cases. These installers are often employed to spread the software built on the Justplugit engine, and they can be used to distribute other adware, potentially unwanted programs, and more dangerous malware. 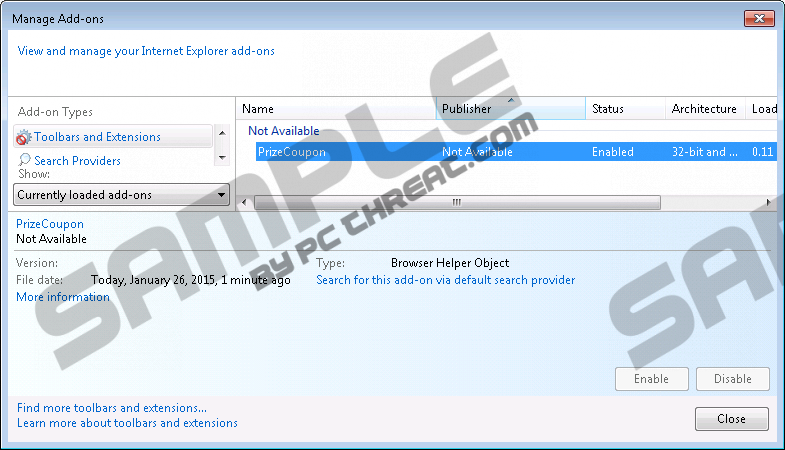 It is most likely that Prizecoupon has been installed on your PC with other programs as well. Therefore, once you remove Ads By Prizecoupon, you might have to take care of the removal of other programs. Did you know that Ads By Prizecoupon might appear to be displayed by a different program? According to our researchers, the ad-supported program can be installed with a slightly different name to confuse computer users and to create removal obstacles. Nevertheless, it should be clear to you that by removing PpriizeCoouponM, you will delete Ads By Prizecoupon as well. Note that there are plenty of different name variations that could be used to represent Prizecoupon. If you need help removing Ads By Prizecoupon from your browsers, we advise trusting the automatic malware removal tool SpyHunter. Click the download button, install the application on your PC, update it, and allow it to detect and remove all computer infections. You might be able to delete Ads By Prizecoupon manually as well. Use our removal guides, and do not forget to scan your operating system with a legitimate malware scanner. If any threats remain active, your manual removal was not successful. Open the Start menu (tap the Windows key on your keyboard). Quick & tested solution for Ads By Prizecoupon removal.